Wishing all of you a lovely holiday 2017. Take time to sip a mug of hot something before a warm fire. May you be with friends and those you love. Let your hearts remember kindness and hope. And here’s hoping you receive books or bookstore gift cards for gifts! My thanks to all of you for following this blog, for buying my books, for your good wishes and support, and your kind encouragement. This is just to let you know that my second eye surgery was successful, and I’m on the mend. I’m hoping to resume reading and computer work in another week or so. Meanwhile, I have once again put up the space tree in my office, one adorned with robots, astronauts, rocket ships, and aliens. 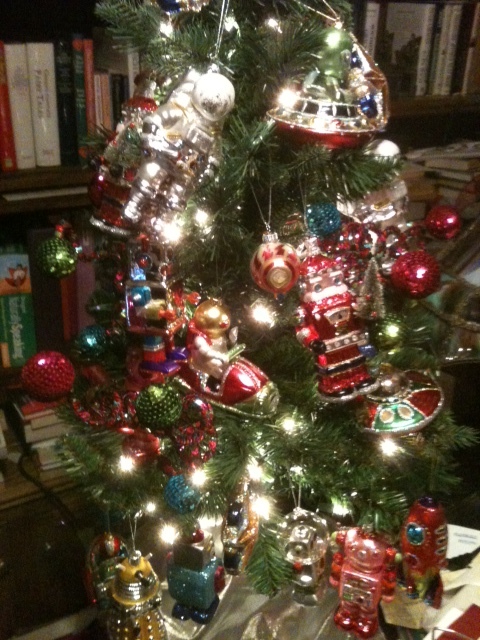 If you look at the bottom left corner of this photo, you can see the Dalek ornament. It’s my favorite. I’ve always had a soft spot for Daleks. Editorial feedback is coming in for my manuscript, THE FANTASY FICTION FORMULA. So far, things look positive. I’ll keep you informed of its progress. Sorry that I can’t share more news with you, much less offer you a better post than this, but my time on the computer is up. May your holidays be merry and bright, and happy New Year to you all.